Dept. of Defense says, "Left the entire room spellbound.. Magic and flair unparalleled by anything..."
I first met Dave while he was performing street magic at a local casino. He delighted the crowd and kept them captivated as he performed amazing energetic card tricks and joked with the crowd. Since then I have seen quite a few stage performances and his act is always unique, fresh and entertaining. Constantly coming up with new material, I have yet to meet someone as dedicated to their craft. One that really has me stumped was where Dave asked me think of a shape. I told only my sister of the shape. Then Dave pulled a folded up piece of paper from his wallet and sure enough, the shape was on the paper! This guy has way more complicated and impressive things up his sleeve but to this day I am stumped onthat one! Hire Dave for your next event with confidence! Dave is the Best of the Best! Dave is the best of the best. 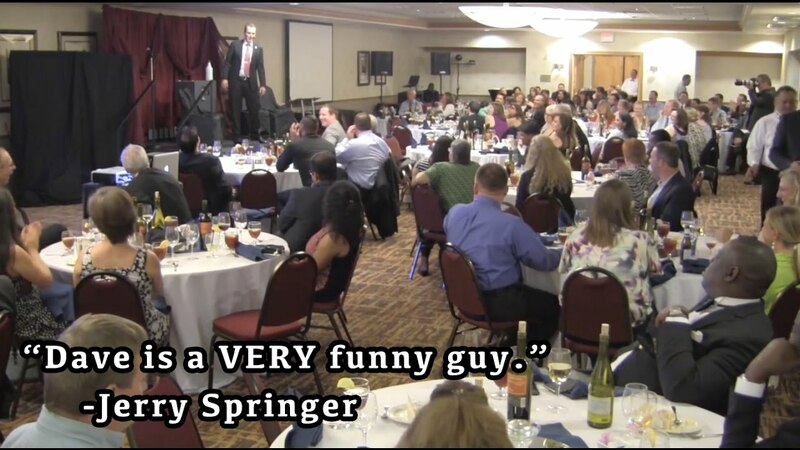 He performed for our group of Defense Department employees at a recent conference, and faced a tough crowd. Tough or not, he immediately put them at east and had them all on the edge of their seats and laughing in no time. Everyone agreed Dave was the absolute high point of the week-long meeting. I've since seen Dave perform several times for both large and small groups, and he always brings his A game, along with a TON of experience. I highly recommend you let Dave work his magic for you and your event. It is ALWAYS a pleasure performing for you. Next time you are out in Vegas again, let me know and we will get together for a bite to eat. At first I wasn't sure that hiring a magician was going to be the best way to entertain our VIP guest in our hospitality suite. Dave Johnson was the best choice, not only as a magician but as entertainment. He showed up early to set up and made sure that his brand of jokes and magic were on the level with what we expected. We have received wonderful reviews from our VIP clients all mentioning how much they enjoyed the magician. We can not wait to work with Dave again. Thanks for including me in your entertainment of the holiday suite. Your DJing is awesome and the clients had a great time. Get ready to laugh and enjoy your event with this guy!!! Hi Leigh! This was an entertaining event for me too. I really enjoy having the opportunity to bring people together in a fun and interactive way. I hope to work with your group again! Dave is an professional magician of the highest caliber. He has material suitable for corporate settings, dinner parties, or marketing your products. You can definitely tell that he doesn't just call himself a magician because he went and picked up a magic kit or watched a DVD. His material is original, polished, and well constructed. Thank you for the kind review PJ. It is much appreciated. I had the pleasure of meeting Dave Johnson recently at a coffee shop in Henderson. I thought I recognized him so I struck up a conversation. I asked, “Have we met before”? at the D casino in downtown Las Vegas last year. During his act, I had mentioned to my wife to watch the magician. She said, “Yes, he’s very entertaining”. I told her, “Entertaining sure but that guy can also work the room”. A very rare ability today in magicians. I told her, “He’s not only entertaining, he’s impressive”, “keeps the room energized and cool at the same time”. She thought that was very humorous, because as it turned out, we had seen him before, at the Tuscany casino, working with Gallagher and I had made the same remark about Dave at that time! During our coffee shop conversation I told Dave I certainly could have used his talents at my yearly sales “kick off” meetings. Those meetings could be brutally dry for my sales force. Over the years it had become increasingly difficult to secure professional talent, who could keep the attention of 110 sales men and women for an extended period of time. I suggested to Dave that he may want to explore the option of doing business gigs. Not realizing, that he already does business gigs, I was not surprised. I retired several years ago (Marketing) so my days of utilizing such a talent as Dave Johnson at my meetings are behind me but I can still have the pleasure of watching him perform. I would highly recommend Dave to anyone tasked with the challenge of putting together a corporate event. 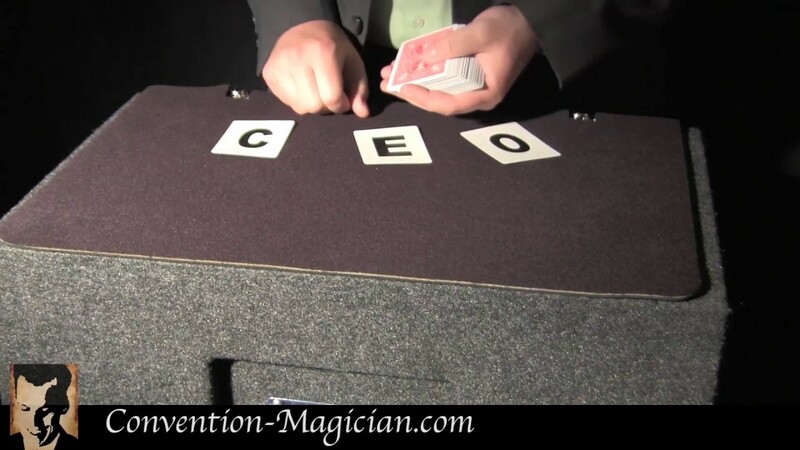 Take a quick look at his website LasVegasConventionMagician.com. Of course if you don’t feel my recommendation is enough to get your finance department onboard, just ask Gallagher!!! It has been more than a pleasure all the times we have run into each other throughout the years. You are a stand up guy and one that I am proud to call my friend. Unions: The Magic Castle & I.B.M. What does Dave and Veronica Johnson give you at your event? It all depends what you want. As far as balloon decor, it's up to your imagination. Would you like a magician to stroll throughout the audience and blow their minds with expert sleight of hand? Perhaps he should give them a DEMONSTRATION OF COUNTING CARDS IN BLACKJACK THAT HIGHLIGHTS HIS INSTANT PHOTOGRAPHIC MEMORY and in most cases ends in one of them asking to take him to Vegas (which he always politely declines as he goes there for work enough)… Maybe he will make your company, organization or guest of honor's name appear on the side of a deck of cards as he SHUFFLES THEM INTO ORDER IN THREE SHUFFLES. Those are some highlights of the close up experiences that Dave gives his audiences. • Interaction with the audience on a level that pushes the envelope of everything. "I threw a party for the founders of the top internet companies, from Dropbox to AirBNB to Square, and all of them were blown away by Dave's magic. Many of them told me afterwards it made the evening for them. Founders of tech companies are tough to fool, and all were left wondering about Dave's tricks." "Dave is a talented performer… I highly recommend Dave for a variety of settings to demonstrate his talents." "David, our magician, kept the activity level around our booth high, as well as the level of excitement and energy. While other booths were quiet and empty, ours was buzzing with activities…like the busiest booth at the fair!" "Your movements and interaction with the audience are already superb, and your timing is impeccable." "He is hard to hold down and his magic is good stuff." "One of the Great Magicians I have encountered." 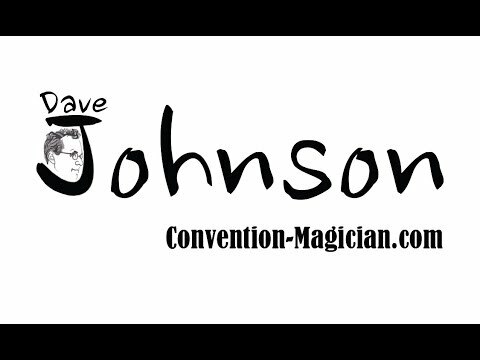 "Dave Johnson is a warm and jovial, bigger-than-life magician, a real sweetheart. His colorful personality fills the room as he fools his unsuspecting volunteers to the audience's delight." ARE YOU THE EVENT ORGANIZER FOR YOUR COMPANY? Looking good for your boss is a trick in itself. Dave and Veronica Johnson make that easy by providing an entertaining experience every single time. If you are in charge of the event from start to finish or just need to hire the entertainment and/or decor, they are professional and a pleasure to work with. We have everything needed for balloon decor. People who have personally helped me in the entertainment field along the way have been Gallagher and Amazing Johnathan as well as numerous other entertainers and bookers that have put me in front of thousands of people. I have studied the greats such as Johnny Carson, Jack Benny, Steve Allen and David Brenner. As far as my business and psychology background, there has been formal schooling at the University level and continuous education of people like Brian Tracy, Malcolm Gladwell, Gary Vaynerchuk, Kenneth Blanchard, Dale Carnegie, Napoleon Hill and others. -3 hour access to venue without public present to set up show for sound, magic, curtains, cameras, projector, etc. We have had the privilege of working with Dave Johnson on several occasions I can say with all honesty that his stage presence his personality and his professionalism is incredible. I also know that his dedication to his craft and his work ethic to deliver a great show is unmatched. I would highly recommend him and I thank him for all that he has done for us. I have seen Dave Johnson preform many times. He is an outstanding magician and was a regular guest on my husbands show Sinsation the Show. His interaction with the audience was amazing and he is very funny as well as talented. "Dave is a talented performer... I highly recommend Dave for a variety of settings to demonstrate his talents." 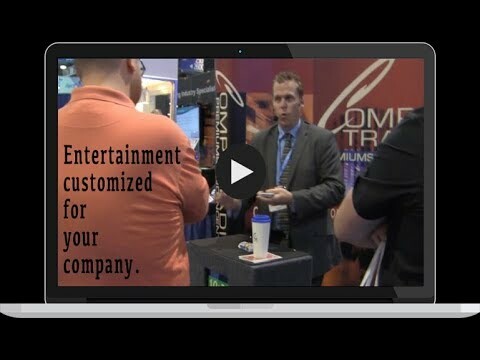 "David, our magician, kept the activity level around our booth high, as well as the level of excitement and energy. While other booths were quiet and empty, ours was buzzing with activities...like the busiest booth at the fair!" "Interactive comedy magic at it's best! Dave has great skills as a magician and he will make you laugh big time!" "Dave Johnson is a great Comic Magician who has a quick and clever mind with a character onstage that evokes attention and laughter." "I recently recommended Dave to an EMMY AWARD winning friend of mine for a private party. They thought he was great! Dave is a no worries, get it done, professional. I strongly endorse this unique entertainer." 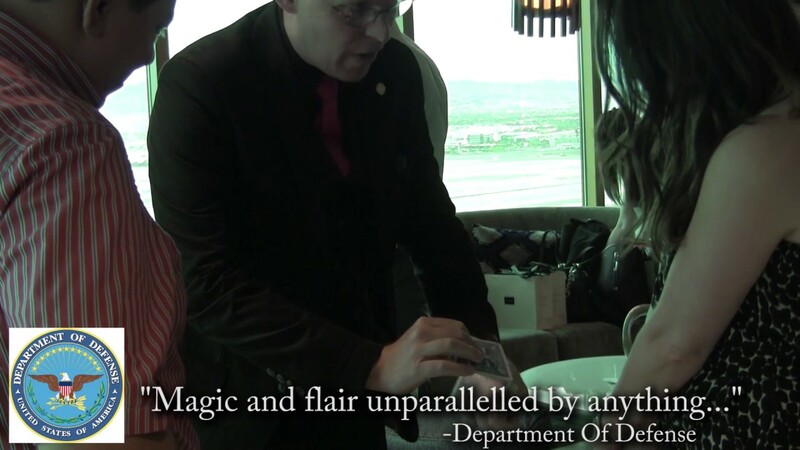 "Dave is our go-to guy when it comes to requests for magic and comedy performers in Las Vegas. He has a true passion for his trade, and it shows in every performance. More importantly, client reviews are always positive. This is on account of not only Dave's talents, but his devotion to both client and audience satisfaction." "His material is creative and unique, and he gives a solid, professional performance. Our audiences adored him. This guy is going places! We look forward to working with him again!"